Sencha is a type of steamed Japanese green tea that requires a different brewing technique and temperature than Chinese greens. “Senchado” refers to the way of drinking and enjoying Japanese green tea, and the following will be a guide to doing just that. In the production of Sencha, the tea leaves can only be harvested for a short time each spring. Shortly after plucking, leaves are steamed to prevent oxidation (rather than fired, as is often the case for Chinese green teas), and then they are rolled and dried until they take on the long, thin shape. Next there is a sieving and cutting process, at which point the cut leaves are sorted according to color and shape. Kyusu teapot: Kyusu pots are the traditional option for brewing Sencha. The teapot featured in this video is our Edo teapot, a Tokoname clay teapot with a built-in fine mesh strainer. Its round shape allows enough room for leaves to expand. 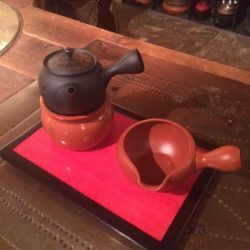 Kyusu leaf holder: The leaf holder can be used to hold discarded tea leaves and to receive the water used for waking up the tea leaves. Water cooler (Yuzamashi): The water cooler is used to hold the cool water that wakes up the leaves. It is also used as a pitcher for the tea once it has finished steeping. Tea caddy/tin: An airtight container is ideal for storing loose leaf tea. Bamboo scoop: Useful for scooping small leaf teas. Fukamushi: “Deep steamed” Sencha, known for a creamy, buttery texture and beautiful green color. Fukamushi Senchas tend to have some broken, dusty particles of tea along with larger pieces, which is a natural byproduct of the deep steaming process. This is not an indicator of low quality, and rather contributes to a desirable creaminess in the brew. Asamushi: “Light steamed” Sencha. Leaves do not break down as much as they do in the Fukamushi process. Therefore, they may be larger, producing a very clean, crisp and clear brew. Kabuse: Kabuse is a Sencha that is shade grown for a week before plucking, which aids in the production of chlorophyll, increases both caffeine and altheinine (an amino acid that has a calming effect), and can add sweetness and reduce astringency, making for a very desirable smooth, sweet and vegetal tea. Tamaryokucha: Tamaryokucha is produced using similar methods as Sencha, but is finish dried in a tumbler, giving the leaf a curled, wavy shape, rather than the straight and needle-like shape of Sencha leaves. This tea can be brewed like Sencha.